I'm having an issue with my eGPU coming up as unsupported on the XPS 13 2-in-1. I have updated my BIOS and all Thunderbolt drivers to the latest ones off of the Dell website but it is still showing up as unsupported. Another user with the same laptop over at Reddit ( https://www.reddit.com/r/Dell/comments/5mlogw/just_bought_an_xps_2_in_1_from_bb_ama/) shows that he got his working with the Razer Core and TheITSage was able to get it working with the Alienware R4 which uses the same TB3 controller (15D9). Any suggestions? I'm trying to hook mine up to the PowerColor Devil Box w/GTX 1070 FE. The computer recognizes the eGPU enclosure, it is just showing it is incompatible because "eGPUs are not supported". 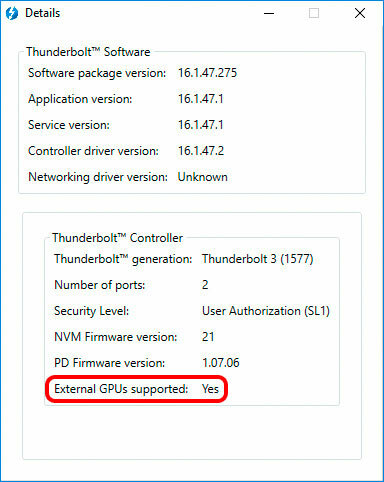 My Dell XPS 9350 shows "External GPUs supported: No" as well. What do you see in Device Manager under Displays? Have you tried turning "Security Level:" to No Security (SL0)? If not, access the BIOS to make that change and see if it makes a difference. I will check the BIOS. My display adapters only show the iGPU. 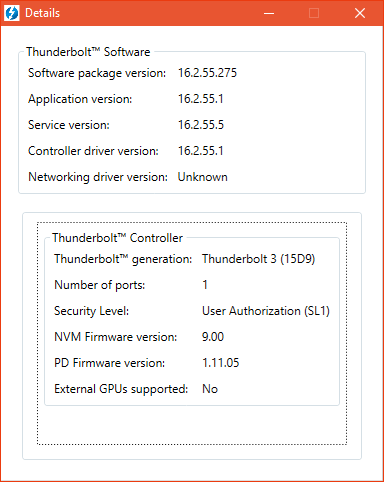 Do you know if there is a NVM firmware update for your laptop? Yours is awfully outdated. It is the "latest one" per the Dell website. Any success in the past month? Any update on this one guys? I have a new XPS 13 2in1 and want to use it for some light gaming (halo wars, Ark) just wondering if it is possible? Never got it to work. I ended up returning the laptop due to battery drain issues during sleep mode, along with the irritating screen brightness changing. I've been testing a Dell XPS 9365. It works with both the AKiTiO Node and Mantiz Venus. @theblazingwasab sorry to hear of your bad luck. It has a lot to do with timing. Dell has since released fixes for those issues. Asus also has a firmware update to support more computers. How did you get it to run? My NVM is version 9.00, external GPU support: no. Please share with me the magic how to turn the "no" to "yes". Such firmware allows detection and use of TB3 eGPUs on hosts such as yours that are not certified for them. I have the Devilbox, looked up the link to the new firmware, flashed it and the eGPU works like a charm without any updates necessary on the Thunderbolt firmware from Dell's support. Amazing! Thank you very much for this important hint! Sorry bump kind of old thread! I got a couple questions! 1-How do you manage to get power on the Dell XPS 13 9365 (2-in-1)? I understand it has only one 4 lanes Tb3-USBC-Charping port wich is used to connect to eGPU....so if the TB3 port is being use for te egpu... laptop recieves power from this cable aswell or you just run the laptop from its internal battery? 2- I plan on using akitio thunder3 pci-box for the gpu and use its extra tb3 port for a multiport donlge to connect ethernet and all my peripherals. Do you think this would work? For your needs, the Mantiz Venus enclosure is the best choice atm. It has upto 87W power delivery to charge your XPS 9365 while the eGPU is plugged in. It also has 5x USB ports, 1x Ethernet power, and 1x SATA connector. Any posible ETA on when it might be available on amazon? Side note: as far as I know, all XPS laptops (esp recent ones) work well with AMD XConnect. You do need eGPU box with the latest NVM. If you can see the GPU in the Device Manager after you plugged it to your laptop, then just ignore "eGPU not supported" warning and install the driver. OEMs put that warning so they do not get support calls associated with eGPU; it does not mean that their hardware cannot work with eGPUs. P.S. I have Dell XPS13 9360, updated to the latest system BIOS, and with Crimson 17.6.2, no issues whatsoever. I agree that verbiage causes confusion. I hope Intel get rid of that in its Thunderbolt Software. The early version of Intel Thunderbolt Software didn't have it at all.